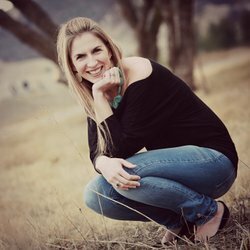 Today’s guest is Kate L. Mary, author of the Broken World series. 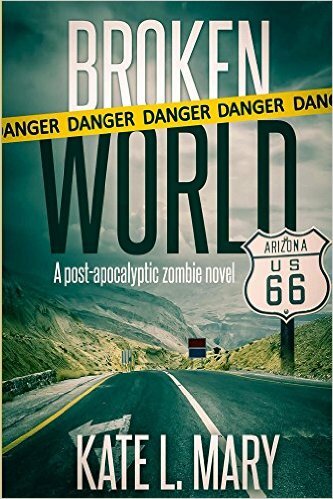 Follow protagonist Vivian Thomas on the road in the midst of zombie mayhem as she and her DD’s convince a duo of redneck brothers to give her a ride to California so she can locate the daughter she gave up for adoption. A stay-at-home mother and Air Force wife, Kate and her family have lived in Georgia, Mississippi, South Carolina, California and Oklahoma. So in other words, there’s a distinct chance I might be able to convince her to become the Bookshelf Battle Blog’s 4.5th reader. Hello Kate. Thanks for taking my call on the space phone. Q. Let’s talk about the role of trust in a zombie apocalypse. Sometimes a disaster can bring out the best in people. Other times, it can bring out the worst. Unfortunately, you never know who you’re dealing with until it’s too late. My group and I, having just located a survivor camp operated by a retired used car salesman/former television extra, are having trust issues. I think it’s a pretty sweet set-up. My girlfriend thinks we should run. Naturally I thought about Vivian, who makes the tough decision to trust a pair of redneck brothers on her quest to find her daughter. Can anyone ever be fully trusted in a zombie apocalypse? A. Trusting people during normal times can be tough, but when it comes to a lawless world it’s an even bigger gamble. I know a lot of people hold the belief that humans are basically good, but I wholeheartedly disagree. People are full of bad intentions, and too often the only thing keeping them from acting on those intentions are the consequences. Take away the threat of punishment, and the world will very quickly get a lot darker. In the case of the used car salesman/former television extra, I’d have to say I’m with your girlfriend. I know the idea of a used car salesman being sleazy and underhanded is just a stereotype, but throw the role of television extra on top of that and every warning bell in my head goes off. This person spent his free time pretending to be someone else on a regular basis. What makes you think that just because the world has ended, he’s stopped pretending? Q. As a fan of zombie books, movies, TV shows, etc., I’ve noticed that whenever a group of people happen upon a place offering shelter and safety, it’s usually some kind of trick. Someone inevitably ends up robbed, beaten, killed, sold into slavery, chopped up into lunch meat or what have you. Maybe that’s why my better half is so jittery. A. In a disaster like this, the idea that there are no good people left in the world has me thinking one thing: If that’s true, why go on? If you’re a good person just trying to survive, you have to assume there are other people out there with good intentions as well. But trusting someone shouldn’t be your first inclination or you’re liable to get robbed, beaten, killed, sold into slavery, or chopped up into lunchmeat. I think it’s important to give off a “thank you for your hospitality” vibe while keeping your eyes open for anything suspicious, much like Rick and crew did when they first arrived at Terminus at the end of season four of The Walking Dead. You have to keep hope alive or you’ll find yourself turning into the very monster you’re afraid to run into, but you need to be smart about it as well. Q1) Is that actually true or is that just something that women say before they make a beeline for the hunky man meat? A. It’s actually true! While hunky pieces of man meat are great to look at, that was never the type of man I dated, and it definitely won’t be who I rely on when the zombie apocalypse hits. Strength will only get you so far before a horde of zombies decides they want to feast on a meal of muscles, but intelligence will keep you going. And a sense of humor will not only keep you from losing your mind, but give you something to keep going for. While I do share the common problem of most female Walking Dead viewers—a love of Daryl Dixon—I have to admit that I’m in major awe of Glenn Rhee. I wouldn’t mind teaming up with him at the end of the world! A. I’m all about the adorable kind of nerd. Star Wars toys aren’t a must, but they also aren’t unwelcome—I own a few nerdy Walking Dead toys myself. My husband is a toy collecting nerd as well. For Father’s Day the last two years I got him Simpsons Lego sets. They are currently assembled and on display above our fireplace. Q3) What is it about a nerdy/non-traditional hero that intrigues you? A. I think it’s the unexpected. Seeing someone who didn’t think much of himself before the apocalypse rises to the challenge and becomes an important part of a group’s survival. Anyone who looks at a “hunky” guy will assume he’s going to be able to take care of himself, but it’s the people who surprise even themselves who are the most enjoyable to root for. Q4) Who are some of your favorite nerdy, non-traditional, non-hunky heroes? A. Glen Rhee of course. The evolution of his character over the last five seasons has been incredible to watch. Every now and then I like to turn on an episode from season one of The Walking Dead just to compare the characters, and seeing how much he has grown since then is mind-blowing. I was also a huge fan of Chuck when it was on. Watching Chuck fumble his way through assignments was adorable, but seeing how much he had changed by the end of the series was even more fun. Q. The Broken World series is in Amazon’s top one hundred when it comes to post-apocalyptic and dystopian fiction. What’s your secret to bringing so many readers into your world? A. Honestly, I think it had a lot to do with timing. I wrote the first three books a few years ago, but sat on them for a bit while agents and editors took their time considering publishing Broken World. By the time I finally got around to putting the first book out myself, The Walking Dead had reached the status of TV phenomenon, and it’s popularity really helped the series take off. The fact that it’s a great series—I never get tried of rereading these books!—and so different from a lot of zombie books out there helped even more. Q. What inspired you to take your ideas and turn them into books that zombie fanatics the world over can enjoy? A. The Walking Dead, of course. I’ve always loved post-apocalyptic stories, especially zombie stuff, but the sudden popularity of The Walking Dead helped form a story in my head that I just couldn’t get rid of. I almost didn’t write it as a zombie novel, though. If you do any kind of research on what editors/publishers are looking for, you’ll discover the sad fact that they do not want zombie fiction. They say there’s no market for it, which is just crazy—especially now! I wrote the first chapter of Broken World as a post-apocalyptic novel similar to The Stand, but without the religious undertones. But only one chapter in and I changed my mind, deciding to take a risk and write the zombie novel I’d been thinking about for months. Broken World was the result, and I’m so glad I took that leap. Q. Kate, thanks for stopping by, and especially for enduring my inquisition vis a vis nerds vs. hunks. Before I hang up the space phone, do you have any last minute advice that could help my friends and I brave the zombie apocalypse? A. Don’t lose hope! It’s the one thing that will get you killed faster than a horde of zombies. If you don’t have some kind of hope for the future, you won’t fight as hard or run as fast. You’ll find yourself wishing that you never wake up when you lay down to sleep at night. If you don’t have any hope that you will be able to find a safe place or that the horror will one day come to an end, it won’t be long before the only end you can imagine is death. Thanks so much for having me, and I hope you and your group find a safe place to ride out the worst of the zombie apocalypse! Happy Saturday needs, geeks, dweebs and other readers totaling 3.5! Bookshelf Q. Battler here with another #31ZombieAuthors reblog. This time it’s Kate L. Mary, author of the Broken World series, who inspired nerds the world over with her assertion that women find nerds preferable to hunks. I’m not sure if it’s true but she makes a good case. At any rate, I stopped doing sit ups and focused more on my action figure collection, but then again, I was already doing that anyway.